SiteGround vs HostGator – Both are leading web hosting companies with similarly priced hosting plans. One may have slightly more affordable options, but at what cost? Let’s take a look at the speed, uptime, features, pricing and more between these two web hosting companies and see which can some out on top. 8. SiteGround vs HostGator – Which Is The Best Web Hosting Company? We found that although the pricing tiers are slightly cheaper with HostGator, the service falls short in some places, where SiteGround excels. Here’s what you should know when choosing between SiteGround vs HostGator. Server uptime is a crucial factor that any web hosting company needs to make a priority. SiteGround says they have a warranty to maintain 99.9percent of their time. This warranty applies across the board, regardless of which hosting plan you are on. We are impressed with the fact that SiteGround has an automatic detection system that senses if there is any chance of server lag, and automatically makes a backend update before servers go down. We host HostingRadar.co on SiteGround and have never once experienced any server downtime at any time. Likewise, HostGator also offers a 99.9% uptime promise. We have found that in our testing, both SiteGround and HostGator performed nearly the same in high-speed quality. How close a web hosting companies’ servers are to your traffic’s location will determine website speed. So it’s important to choose a company with a server as close to your readers/customers as possible. With SiteGround you can choose your server location from Singapore, London, Chicago, and Amsterdam. Although both companies provide good speed on their shared server plans, if speed is your main priority we would recommend going with a dedicated server or cloud plan. Something we appreciate is that SiteGround runs daily backups of your website, and includes it at no extra cost. They also offer Sucuri site scans for malware and viruses. Malware scans and website backups are done weekly with HostGator. To have additional backups made with HostGator you have to pay more money. Both SiteGround and HostGator offer 24/7 Support, free SSL security certificates and one free migration. They both also offer a very user-friendly CPanel which is great for beginners. 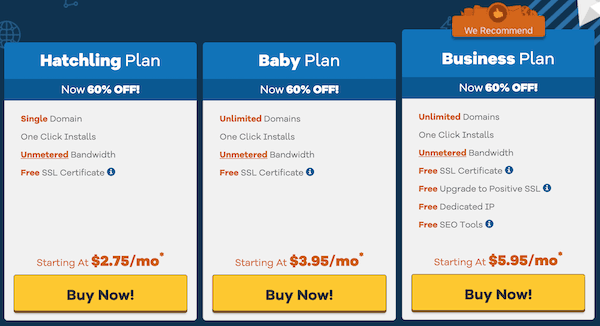 HostGator offers unlimited bandwidth, which is excellent. Whereas SiteGround has limited CPU usage, which requires upgrading if your website has a lot of traffic. We find that the features overall that SiteGround provides is better. SiteGround offers a 30-day money-back guarantee. This applies to the hosting plan only, domains and add-ons are non-refundable. HostGator offers a 45-day money-back guarantee (hosting only), and only available to individuals with brand new contracts. Refund are only given if you originally paid by credit card. SiteGround includes three shared hosting plans that may be Updated if need be. All these include a monthly limit of 100,000 visits. SiteGround is renowned for providing world-class customer service. I have personally had the best experiences with their customer service, over the many years I have reached out to them. The 24/7 customer service representatives are helpful, friendly and knowledgable every time. Not only that, but they are notorious for picking up the live chat in under a minute. Whenever you contact a SiteGround service rep, you will see his/her photograph, so you can actually see who it is that is helping you. HostGator offers helpful customer service 24/7 as well. However, wait times are much longer than SiteGround, it takes HostGator reps longer to pick up a call/chat. Although both web hosting companies provide excellent service and features, overall, we find that between HostGator and SiteGround, SiteGround is the best choice. However, our #1 pick for best web hosting company is not actually either of these two. ==> Find out who our #1 pick for best web hosting provider is here!